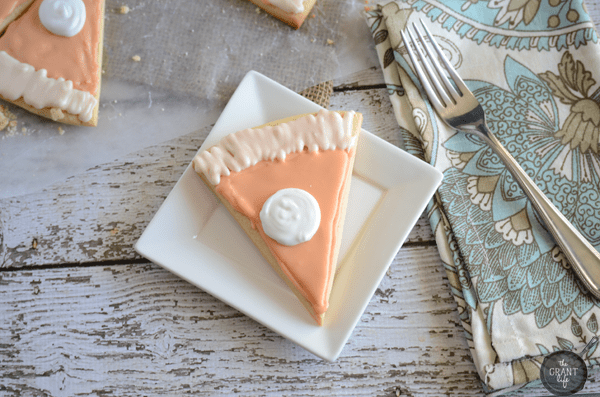 Make pumpkin pie portable with these pumpkin pie cookies! I feel like if I shared them all with you that you might think I’m absolutely nuts. But I’m going to anyways, because, well, I probably am. So I’m hanging out in my house and a man walks through the back garage door and into our kitchen. I was scared, but once he saw me he took off running. Of course I follow him and he runs back to his backyard behind our house. The fence has been torn down and his dogs are roaming our yard. I panic because you never know how dogs are going to react together. So I frantically call my dogs and get them in the house before looking at what the man did to our shared fence. It was a hot mess and half of it was missing with boards scattered around my yard. And then I woke up. That was it. Just a creepy guy in my house and a destroyed fence dream. Of course I check the backyard after I wake up to make sure it wasn’t real. [Because, well, ya know.. I’m that person.] My fence is fine. No creepy guy poking his head out from behind it. I’m pretty sure that dream has stemmed from my dogs barking like maniacs at the back fence lately. They say hello to the other dogs [or so I think] and then go on there happy way most days. But for the past few days that have been going to the side of the fence with no dogs and just bark bark barking. Besides driving me nuts, I’m sure my neighbors don’t appreciate it. One afternoon I went to see what the heck they were getting crazy about. And there was a momma cat and her kittens holed up on the fence line. I wanted to scoop them up and bring them all inside the house with me. I’m pretty sure its a stray which makes me want to scoop it up even more. [Side note – I might be a crazy cat lady in disguise.] The kittens don’t even have their eyes open yet and they just meow so cute. I gave mama some food and now I make sure the dogs leave them alone. So that’s been my life the past few days. Odd dreams and kittens. Oh and pumpkin pie cookies. Because, well, delicious! I used my friend Kirsten’s cookie recipe and tweaked it a bit. I also used her royal icing recipe because its pretty amazing. Add the egg, vanilla and almond extracts. Mix well. Mix in the flour, salt and pumpkin pie spice. Set in the fridge for at least 30 minutes. Remove when chilled, roll out on a floured surface about 1/4 inch thick. Using a pizza cutter, cut a circle and then divide it into 8 pieces. Place on a silicone baking sheet and bake for 10-12 minutes, or until you see the edges slightly browning. Remove and let cool completely before frosting. In a stand mixer or with a handheld mixer, pour the powdered sugar in and slowly add all the ingredients except the water. Beat the ingredients together and SLOWLY add the water. You want the icing to be thick but a little wet. Scoop out 1/4 cup of the white icing and set it aside. Add 5-8 drops of orange food coloring and continue to mix. 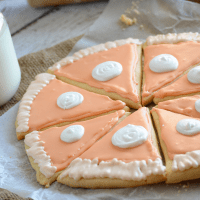 Remove 1/2 cup of the light orange frosting and set it aside. Add 10 more drops of orange food coloring and mix, place the rest of the icing in a piping bag. 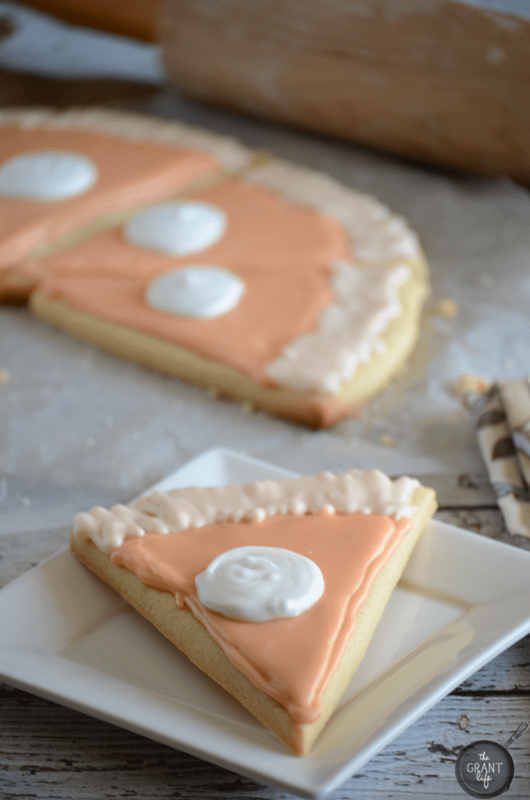 Using the light orange frosting, make the crust of the pie by going back forth with the piping bag. Allow it to dry. 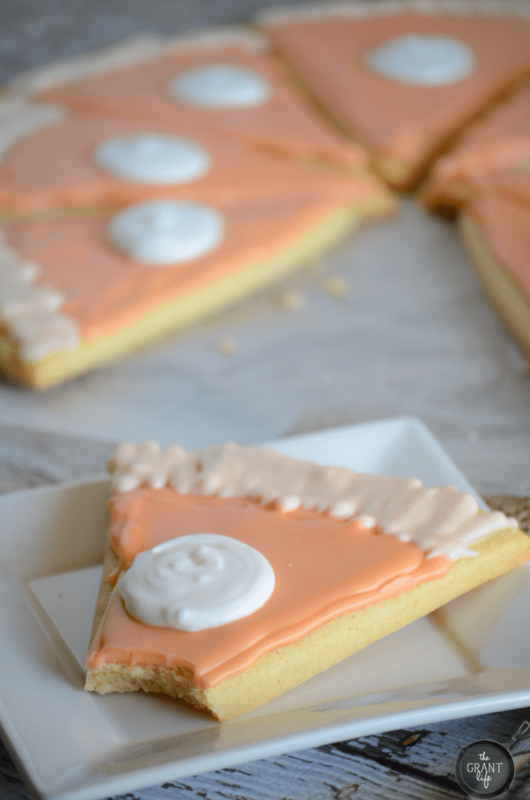 Using the dark orange frosting, make an outline starting from the crust all around the triangle. Allow to dry before flooding it with frosting and smoothing out. 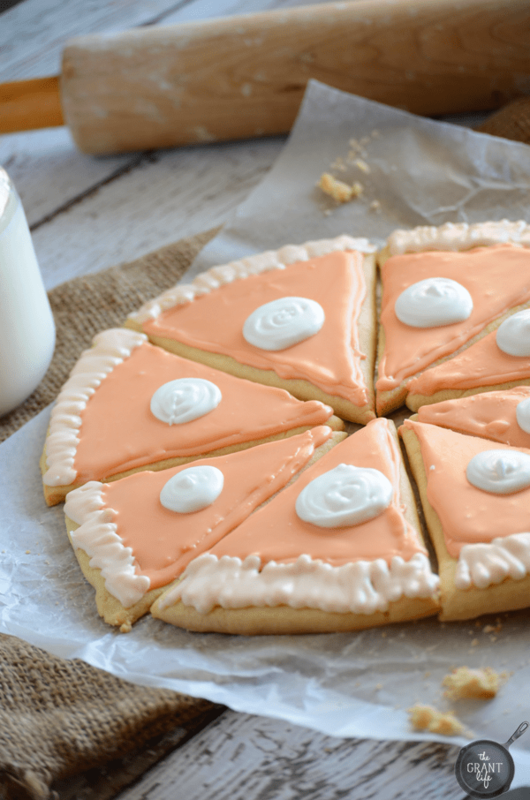 When the dark orange is dry, add a dollop of the white to resemble cool whip. Those are so cute and fun and I want to gobble them up! BRAVO! These cookies are so cute!! So fun for fall!! These are too stinkin’ cute! I bet they taste amazing too…almond flavor and pumpkin pie spice? Yum! 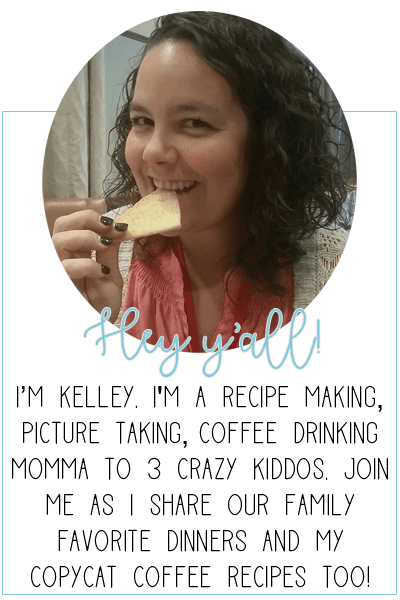 If you’re up for it, I’d love for you to share this at my Creative Ways Link Party. Hope to see you there! How cute are these? I love these and they look delicious. Pinned! Thanks so much AnnMarie! Hope you enjoy!